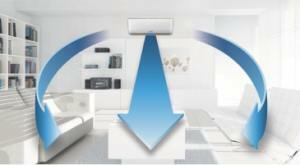 Samsung’s new range of Maximus inverter split systems provide peace of mind in a stylish design. Featuring the new and innovative D’Light Mode along with refined air purification and directional airflow, Samsung’s Maximus allows you to condition your room to your exact needs. The Samsung Maximus is designed so it blends into its surrounds. 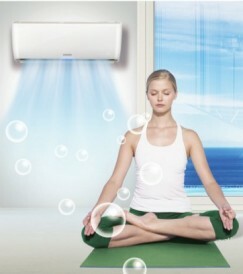 The exquisitely designed air conditioner is a perfect solution for your stylish and modern home. 3D Air allows air to distribute to every corner of the room to ensure even cooling and heating is delivered for perfect comfort at the touch of a button. As well as Auto Vertical and Horizontal airflow the Maximus provides a 13 metre air throw on high airflow. In heating mode the Waterfall Airflow allows heat to be distributed evenly in the room. 3D Air allows you to condition the room exactly how you want it. The Maximus is able to measure humidity as well as temperature levels. In humid environments the air conditioning unit will access the comfort level of the room. If the requested temperature is met, but the humidity level is too high, the Maximus will continue to reduce humidity levels until a comfortable condition is reached. So you can spend less time managing humidity and more time enjoying the things you love. Automatically adjusts the temperature to create an ideal temperature which may help you fall asleep, maintain a comfortable sleep environment and awake refreshed. The new High Density (HD) Filtration system improves the general air quality and can help reduce dust in the room. Enables the air conditioner’s compressor to operate at a reduced intensity when the air conditioner is not required to be run at maximum cooling / heating capacity. Automatically selects the operating mode according to the temperature setting, so the air conditioner heats or cools as required to maintain the set temperature. Gives you the ability to fully program an on and off time to operate the air conditioner.